The pool of available prospects is locked in and the trade chatter is heating up. The Front Office provides all the latest news, intel and projections as the 2018 NBA draft approaches. For an in-depth and up-close look at the potential number 1 pick Deandre Ayton, watch SI TV's latest episode of SI Under the Cover. Sign up here for a FREE seven-day trial. Projecting the NBA draft is an annual exercise in predicting the unpredictable, or rather predicting in spite of it. One of the inherent flaws in mock drafts is their inability to perfectly account for traded picks. Those plans, of course, tend to remain close to the vest until the actual minute they go down. And for better or worse, there’s a lot of speculation surrounding potential trade scenarios at the top of the draft right now. The Suns appear set at No. 1 and are expected to draft Deandre Ayton. Things get complicated immediately after that, with the Kings said to be making calls and feeling out potential returns in deals in which they’d move down from No. 2 and try to extract some added worth out of that pick. There’s enough noise surrounding Sacramento right now to think that it’s probably leaking for a reason as the team (presumably) angles to create more value. The Kings have continued to scout Luka Doncic during the postseason in Spain and have been interested in Michael Porter Jr. all season, at which point it seemed like they were more likely to pick in the mid-lottery. It’s yet to be seen if their efforts will gain any serious traction. Another team to watch closely is the Mavericks at No. 5, who are in position to move either up or down in the draft and could try and dangle that pick to teams interested in Porter or potentially Trae Young, both of whom are generally expected to fall no lower than the 6-7-8 range of the draft. There is some chatter that Dallas wants to be competitive again next season, whether it’s by targeting an NBA-ready prospect like Luka Doncic or by moving down and acquiring a piece to add to its rotation. The Mavericks are armed with cap space and are expected to try and make pitches to big-name free agents, which could accelerate their competitive timeline. NBA Draft Debate: Which Wing Would You Draft First? Others to keep an eye on are the Suns and Hawks, each of whom have multiple picks to dangle. Phoenix could package Nos. 16 and 31, potentially with a player attached, to try and add another pick in the lottery. Atlanta could also look to flip 19 and 30 or 34 for a better selection. There’s also a sense they might consider offers to move down from No. 3, and are known to have interest in Trae Young in that scenario. The Clippers are also known to be assessing options for pick Nos. 12 and 13 and have some interest in Porter, but it‘s unclear as it stands whether they can put together an attractive enough package to move up high enough to select him. Given all the fluidity in the lottery and the number of teams expect a whole lot of posturing and smoke screening in the days to come. Now that June 11 has passed, the pool of available prospects is locked in, with the top international-based players mostly choosing to remain eligible. 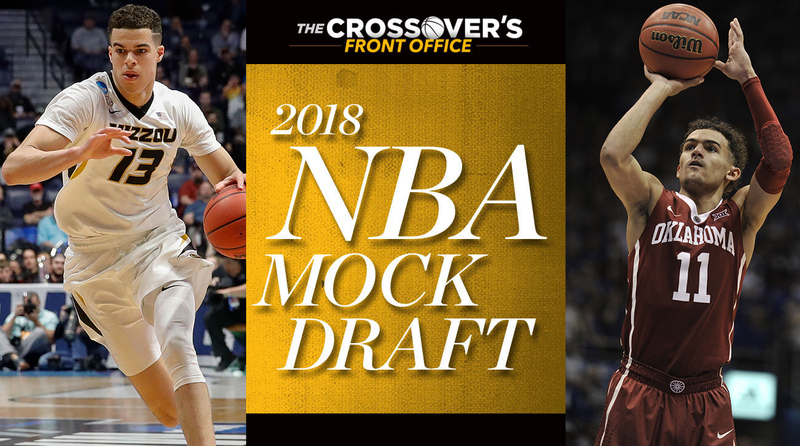 The mock draft serves to project the state of all 60 picks on a given day, while our Top 100 player rankings provide a more comprehensive look at the talent pool. You’ll find the latest information and buzz on teams, prospects and the landscape of the 2018 draft below. 1. Suns: Deandre Ayton, C, Arizona | Fr. It would be a surprise at this point if the Suns went in a direction other than Ayton, who most view as the draft’s top prospect and fits neatly into their situation. The top-rated prospect on our Big Board since the start of the season, Ayton possesses elite physical traits, a developing inside-out skill set and a star ceiling if all goes according to plan. He’ll immediately be one of the most athletic centers in the league. Ayton needs to improve defensively but has all the tools to be a quality rim protector given time. The Suns have worked out Marvin Bagley, Jaren Jackson Jr., and Mohamed Bamba in the past week, but those moves are more likely due diligence. If they can successfully package their other draft picks, it’s certainly possible Phoenix will address their perimeter needs somewhere else in the lottery. Ayton may need to be pushed harder than some to reach his full potential, but he has perhaps the best chance of anyone in the draft to become a true franchise player. *NEW ON SI TV: Deandre Ayton Has Something To Prove. * Start your seven-day FREE SI TV trial now to stream our mini-documentary on the NBA draft’s potential No. 1 pick. 2. Kings: Marvin Bagley III, F/C, Duke | Fr. There is still uncertainty over exactly what the Kings will do with this selection, but Bagley’s athleticism and offensive talent seems like a strong fit He should be able to help immediately, given he’s an extremely productive rebounder and manufactures easy baskets. Bagley has enough of a skill level that he could eventually help stretch the floor as a four-man as he grows. There are major strides he needs to make defensively, and in expanding his offensive arsenal (he’s extremely left-handed). Luka Doncic isn’t off the table here, and there’s also substantial chatter around the league that some in the Kings’ front office have strong interest in Michael Porter Jr. There remains warranted skepticism that Sacramento would actually pull the trigger on him at No. 2, unless their hand was forced by another interested team picking in between those spots, but there’s a lot of talk abut the Kings aiming to move down in the draft. 3. Hawks: Jaren Jackson Jr., C, Michigan State | Fr. Atlanta would surely think hard if Doncic is available here, as he’d immediately be the best player on their team. Given they’re in no hurry to start competing, it makes long-term sense to invest in Jackson, who is the best long-term prospect available here. His extreme youth and attractive potential playing both ends of the floor is the prudent move for a team still in the early stages of its rebuild. He possesses a critical duality for modern bigs: he can step out and shoot from outside, while also defending in space and protecting the rim. Atlanta already has John Collins in place as an athletic, rim-running big, and Jackson’s burgeoning skill level coupled with his defensive mobility and shot-blocking makes him a terrific complement. He needs to mature physically and mentally before he can become a mainstay, but with the strides he’s made over the last couple years, he’s worth a substantial investment. The Hawks are known to have interest in Trae Young as a long-term solution at the point, but would need a way to comfortably move down in order to draft him. The Grizzlies would likely jump at the opportunity to draft Doncic, who makes sense with their immediate needs and is the most NBA-ready player in the draft. Fresh off a Euroleague title and Final Four MVP honors at the ripe age of 19, Doncic’s aptitude for moving the ball, ability to make reads as a ball-handler and overall skill set make him a safe bet to become a quality contributor at minimum. Having an experienced playmaker like Mike Conley alongside him would immediately make life easier, allowing him better looks away from the ball and splitting playmaking duties. A more seasoned Doncic could end up leading the franchise as Conley and Marc Gasol near the end of their prime years. This is likely his floor. The Mavericks are also said to have interest, which might require them to trade up. 5. Mavericks: Michael Porter Jr., SF, Missouri | Fr. There’s talk that the Mavericks may prefer not to draft a center in this scenario, with a potential eye on DeMarcus Cousins in free agency. It’s possible they look to move this pick. If they keep it and are willing to take the risk, Porter makes sense as a fit with their personnel. He’s a wild card in the draft as he continues to work into peak shape, but seems to be trending toward full health. His situation will clarify now that some teams atop the draft have access to his medical information. Porter’s pro day was well-attended, and he’ll work out again in private on Friday for lottery teams only. The game comes easily to Porter, and in a total vacuum his offensive gifts would make him a top-five selection. The risk of re-injury as well as background intel on his personality may continue to give some teams pause. Though he could still end up falling in the draft, there appears to be enough interest to keep him safely in the Top 10. 6. Magic: Mohamed Bamba, C, Texas | Fr. Orlando would be in a strong position choosing between Bamba and Trae Young in this scenario. The Magic’s front office leadership is known for favoring players with length, good physical profiles and skill potential, and should Bamba slip to here, he fits the bill. Young is a clear option but makes less sense given those proclivities. His defensive shortcomings also don’t mesh as well with newly-hired coach Steve Clifford’s preferences. Bamba’s length and defensive upside fits the Magic’s profile, and he brings some risk but also a potentially massive reward. He’s almost certain to impact the game as a rim protector with his sheer, difference-making verticality. His offensive game is rudimentary, but his skill level and touch around the basket continues to improve and he might be able to space the floor as he becomes more confident in his jumper. 7. Bulls: Trae Young, PG, Oklahoma | Fr. The state of Chicago’s rebuild remains in enough flux that it wouldn’t be a shock to see them add another guard despite the presence of Kris Dunn and figure things out later. The Bulls are also viewed as a logical destination for Michael Porter if he falls out of the top five. If Young is available at this spot, it’s possible another team tries to come get him. Of the players on the board in this scenario, Young has the most upside, though he comes with more risk than Wendell Carter, who should also be in the mix if Chicago picks here. His high-end shooting ability and unique flair for the game help compensate for a lack of standout physical traits, and he’s slippery off the dribble and able to score from deep and initiate offense. Defensively Young will pose some challenges, but if a team were to adequately maximize his strengths, it could mitigate that issue. Teams love his talent, and if the Bulls were to pass in this scenario, he wouldn’t fall far. 8. Cavaliers: Wendell Carter, C, Duke | Fr. Given Cleveland’s unusual circumstances as they await a decision from LeBron James, it’s fair to reason they’ll explore their options with this pick. If there’s an opportunity to move down and add more draft assets it could be worthwhile, or if the Cavs see a worthwhile last-ditch scenario to package it for a big enough star to convince James they can make over the roster appropriately. They probably don’t have enough to move up. Carter would be a terrific option at No. 8, giving them a legitimate building block for the future and also an early-career rotation player if they need to stay competitive. He has a clean jump shot that projects to three-point range, nice touch and footwork on the inside, and is a good (though not elite) athlete. Carter offers a nice mix of talent and intangibles, with his main knock being a lack of elite vertical lift and mobility defending ball screens. He’s widely viewed as a prospect with a high chance of reaching his full potential, and with few holes in his skill set. 9. Knicks: Mikal Bridges, SF, Villanova | Jr.
Barring Trae Young or Michael Porter unexpectedly falling to this spot, the Knicks appear likely to select from this next group of available wings. Bridges is said to be high on their list, given the relative level of safety he offers as a floor-spacer and versatile defender. He’s older and closer to contributing in an NBA role than Miles Bridges or Kevin Knox, and fits in nicely on the perimeter as the Knicks build around Kristaps Porzingis. Bridges isn’t perfect—creating his own shot off the dribble is a weakness, and some around the league feel the actual caliber of his man-to-man defense may be oversold. But given what he brings to the table, he should be able to carve out a place for himself and has a chance to become a starting-caliber player. 10. 76ers: Lonnie Walker, SG, Miami | Fr. Philadelphia owns a whopping six draft picks and doesn’t necessarily need to seek immediate help with this first selection. Their roster could use an athletic perimeter scorer for the long-term, and Walker makes the most sense as an upside play if you take the timeline factor out of the decision. He’s a high-caliber athlete and big-time leaper still at an early stage of his development. Walker was a mixed bag this season and hasn’t figured out how to consistently impose his will on games yet, but his explosiveness, ability to get to the rim and jump shooting potential are all intriguing. He needs to become a consistent defender and has just an average offensive feel, but is young enough to hope he’ll mature into a legitimate scoring threat. The Sixers can find more NBA-ready help further down in the draft. 11. Hornets: Kevin Knox, F, Kentucky | Fr. With nearly all their key pieces set to return under contract, it might make sense for Charlotte to draft with an eye toward long-term development here. A prospect like Knox, who’s full of long-term upside, makes sense here in that scenario. While Knox is still figuring things out, he has a lot of appealing tools and should be able to make an impact as a scorer as he matures physically and learns the game. Athletic combo forwards in his mold are in demand right now, and he offers an appealing blank slate at a valuable position. Knox appears to still be getting used to his body and is one of the youngest players in the draft, which leaves room for optimism as he builds out his offensive skill set and gets used to putting the ball on the floor. 12. Clippers: Collin Sexton, PG, Alabama | Fr. The Clippers are looking into packaging picks 12 and 13, potentially with a player attached, to try and move up in the draft, although there’s skepticism as to how high they can actually move based on the packages they could offer, with Tobias Harris seen as their biggest chip. They’re said to have real interest in Michael Porter and would have the best chance to target him if he falls outside the top six. That said, L.A. keeping both picks, banking on upside and hoping at least one of them works out is a perfectly viable option, and their roster could use the youth infusion. While Sexton may not evolve into a star, he should be able to get downhill and attack the paint, and most scouts view Sexton’s work ethic as a positive. To become a starting-caliber guard, he’ll need to step up and make an impact defensively, learn to get his teammates involved and play a more efficient style of basketball. The Clippers could also opt for Shai-Gilgeous Alexander, but look likely to select a guard with one of these picks if they stay put. There’s also a possibility L.A. could draft a player at 12, and use No. 13 as a chip to move down. 13. Clippers: Robert Williams, C, Texas A&M | So. Williams is in consideration for the Clippers here with DeAndre Jordan likely to test free agency, and would be a natural fit into a similar role down the line. He clearly has high-end talent and plays above the rim naturally, particularly for a guy his size. The concerns with him stem more from the intel side, as Williams drew some scrutiny from teams after skipping the combine entirely and raised more eyebrows by deciding to change representation with about a month until the draft. Teams see a potential starting center in Williams, but have doubts as to whether he’ll tap into his full potential. He’s a big-time athlete and will fit into a rim-running, energy role, but needs to up his effort more consistently. Still, he’s an upside play in this range. If Williams falls past the Clippers here, there’s a potential scenario where he slips into the teens. 14. Nuggets: Shai Gilgeous-Alexander, PG, Kentucky | Fr. It could be smart for the Nuggets to move down in the draft from here if they’re able to offload some salary in the process, given an hefty extension for Nikola Jokic is likely imminent. There’s also a sense that after trading down broke bad for them last year, they could be more inclined to stay put. Gilgeous-Alexander should become a valuable player in today’s league, able to help move the ball, match up against bigger wings and help space the floor as his shooting improves and his confidence grows. He showed major improvement over the course of the season at Kentucky, and that capacity to adjust quickly and deal with adversity should play in his favor. Gilgeous-Alexander needs time and needs to get stronger, but has a few different pathways to being successful. He‘s a clear fit with Jamal Murray and Gary Harris. 15. Wizards: Miles Bridges, F, Michigan State | So. It’s worth wondering if the Wizards could move down from here and aim to shed salary if there’s nobody they love on the board. If they keep this pick, Washington will likely grab whichever top prospect falls out of the lottery, and there’s a scenario where it’s Bridges. Though he’s a tweener, Bridges is a good rebounder and passable jump shooter who has potential to be versatile defensively. The Wizards’ frontcourt stands to get more athletic, and having Bridges in the rotation at forward could enable them to play smaller and faster—and to John Wall’s strengths—much more frequently. He’d be great value here if he slips. 16. Suns: Zhaire Smith, SG, Texas Tech | Fr. The Suns are exploring using this pick and No. 31, and likely another asset, to move up and land a second lottery pick, though it’s unclear if that would be enough to move into a desirable spot in the Top 10. Viewed as one of the draft’s bigger home run swings, Smith is a jaw-dropping athlete without much of a résumé. The Suns could afford to take a chance here. He competes defensively, has a feel and passes the eye test, but has also demonstrated little to no ability to generate his own offense playing effectively at forward in his lone college season. He could become a high-flying two-way contributor, or he could flame out quickly if his guard skills don’t develop. It’s worth considering he measured at just under 6'3" in shoes at the combine. If a team can afford to gamble on talent, Smith is a good candidate and looks set to go in the teens somewhere. The Clippers are also said to have interest. 17. Bucks: Jerome Robinson, G, Boston College | Jr.
A talented scorer with strong intangibles, Robinson looks like a first-round lock and has worked his way up into the teens, with 16–23 looking like his range. The Bucks are said to be among the interested parties, and his shooting and ability to play on and off the ball would make for a natural fit with the parts they have in place. Robinson creates his own shot well off the dribble, changes speeds well and can put the ball in the basket from all three levels. He needs to improve defensively, but appears a good bet to figure out a role and stick. He should become a stabilizing offensive factor in someone’s rotation. 18. Spurs: Troy Brown, SF, Oregon | Fr. It’s a testament to San Antonio’s success that this is the earliest the Spurs have drafted since selecting Tim Duncan first overall in 1997 (they traded up to get Kawhi Leonard at No. 15 in 2011). The pick presents an opportunity for their aging roster to get more athletic, and Brown’s ability to move the ball and swiss-army-knife skill set on the wing would make a lot of sense. He’s not extremely aggressive and needs polish as a scorer, but has the feel to pass, handle and defend, and makes sense as an organizational fit. Brown needs to become a much better jump shooter to maximize his talent. He wasn’t especially consistent at Oregon, but scouts have been intrigued by him dating back to his high school days, and he remains a good bet to land somewhere in the middle of the first round. 19. Hawks: Kevin Huerter, SG, Maryland | So. One of the biggest risers over the course of the predraft process, Huerter is known to have secured at least one guarantee from teams further down in the first round and has shut down his workouts. The Lakers and Jazz have both been linked to him as destinations. It seems like his landing spot may wind up a little higher than that, and he’s also been tied heavily to teams selecting in the teens. The Hawks worked him out and are known to be among the interested parties, and his size and shooting ability would seem to offer a level of safety and reasonable floor. As long as his defense proves to be enough, Huerter should be able to carve out a career as a shooter and ball-mover. 20. Timberwolves: Donte DiVincenzo, G, Villanova | So. Tom Thibodeau rarely gives rookies much leeway to begin with, but with some emphasis on winning sooner than later and after drafting a project last year in Justin Patton, it’s fair to reason the Wolves could find more immediate utility at this spot. DiVincenzo fits Minnesota’s need for a bigger combo guard, and his high-energy game and tough mentality would make sense here. DiVincenzo has impressive functional athleticism, good defensive instincts, and is an outstanding rebounder for his position. If he shoots the ball a bit more consistently, he could be more than just a role player. He has to improve as a man-to-man defender and doesn’t consistently create great shots for himself, but he knows how to play with others and offers a bankable degree of value. His range is viewed as 19–30. Musa intends to come over to the NBA next season, and the Jazz would benefit from adding another big wing player into the long-term mix. Utah already has an internationally-minded roster, and Musa’s shooting ability and talent level as a scorer make him an interesting long-term piece. He’s known as an intense competitor and streaky-but-talented scorer. Musa prefers to play with the ball in his hands and has some athletic shortcomings, which likely means he’ll have to adjust to a new role in order to succeed in the NBA. The word is he has some maturing to do as a teammate and person. Remaining in this draft suggests his camp feels good about his range, which is likely 20–30. 22. Bulls: Chandler Hutchison, SF, Boise State | Sr.
It’s now widely known Hutchison has secured a first-round promise of his own, as we first reported following his decision to pull out of the draft combine. He’s completely shut down team workouts, and indications point to Chicago as the team that promised him. Hutchison is a developed prospect who should be able to contribute immediately, and a lot of scouts are high on his tools, shooting ability, and capacity to play on and off the ball. If he makes it to the Bulls here, he should slide into the rotation early on and find a way to make an impact. 23. Pacers: Aaron Holiday, PG, UCLA | Jr.
Holiday has fans drafting in the teens, most notably the Suns, who have worked him out twice, and is pretty firmly in this mid first-round mix. The Pacers have no long-term answer at point guard on the roster, and Holiday can be groomed for a rotation role as Darren Collison and Cory Joseph play out their contracts. He excels using ball screens and spotting up, and could conceivably become an eventual starting-caliber player, though in likelihood he’ll be most valuable leading someone’s second unit. e will have to fight hard to overcome his lack of size on the defensive end. Although Holiday doesn’t have star upside, he doesn’t have many holes in his game either, and having two successful brothers in the NBA will help him from background standpoint. 24. Blazers: De'Anthony Melton, G, USC | So. The Blazers remain in need of a defensive-minded perimeter presence to complement their stars and should have some options in that regard at this spot. Melton is viewed as a first-round caliber talent and would fit that description cleanly. He’s best paired off the ball alongside a creative guard, with long arms, active hands and a knack for forcing mistakes on the defensive end. Melton has a good sense of how to play in transition, but isn’t very good at finding ways to score in the halfcourt right now. His jump shot was inconsistent at USC, but looks solid mechanically and isn’t viewed as a dealbreaker. 25. Lakers: Grayson Allen, G, Duke | Sr.
It’s looking increasingly likely Allen will land among the first 30 picks, with interest coming from teams as high as the teens. He’s a mature prospect and a consistent shooter with deep range who can make off-balance jumpers. Allen is also a plus athlete and tough-minded player who can facilitate on the ball a bit as well as threaten away from it. His overall skill set has a lot of appeal as a versatile backcourt player given how perimeter-focused the league has become. The Lakers will continue to add more weapons around Lonzo Ball, and get a player who can contribute early on if they’re able to snag a big free agent. 26. 76ers: Mitchell Robinson, C, Western Kentucky | Fr. This pick will be dependent on what direction the Sixers take at No. 10, but it’s fair to assume they address the perimeter there and look elsewhere at this spot. It’s wholly unclear what happens with Robinson at this stage, but on raw ability most scouts believe he should be a first-rounder. He has the ability to become a force as a rim-running, shot-blocking center, but there are major questionmarks surrounding his decision to skip college basketball and as to how much skill he can actually develop. Teams will have to feel comfortable assuming the risk, and it’s still possible he falls to the second round. Robinson may have the widest range of any player available. 27. Celtics: Jalen Brunson, PG, Villanova | Jr.
Boston is said to be looking for perimeter help at this spot, with Brunson among the players tied to this pick. Given the Celtics tend to favor cerebral, team-first players, he makes a lot of sense given the uncertainty over Terry Rozier’s long-term future. Brunson is essentially a can’t-miss role player at this spot. He’s mature, smart and skilled enough to hold his own, and he’s one of the draft’s elite players in terms of feel. He’ll have to work to overcome a gap in terms of athleticism, but his ability to post up other guards, space the floor and make reads could make him a useful player early in his career. 28. Warriors: Josh Okogie, SG, Georgia Tech | So. The Warriors are likely to draft a wing here after getting strong results out of Quinn Cook at backup point guard, Patrick McCaw IS a restricted free agent and with Jordan Bell and Damian Jones under contract as young frontcourt pieces. While his game is still rough around the edges, Okogie is the right type of upside play for the Warriors, who won’t require him to do too much and can naturally help rein in his shot selection and let him focus his energy on becoming a stopper. He’s helped himself since the combine and will have a shot to land in the late first round. There’s talk that the Nets want to move up in the draft, and they have the cap space to absorb a bad contract as part of that exchange. Their front office likes to develop upside, and Okobo—who seemingly intends to come over to the NBA next season—can offer that. He’s athletic, has size and scoring touch, and some ranginess on the defensive end. Scouts are split on where he should be drafted, but the first round is in play given how his long-term potential as a lead guard stacks up with his peers. 30. Hawks: Melvin Frazier, G/F, Tulane | Jr. Given they have four of the first 34 picks in the draft, it’s possible Atlanta tries to package this pick with No. 19 and something else to move up and net another selection in the lottery. If they stay put, they’ll have some options. One of the combine’s big winners who shut it down on the second day of scrimmages, Frazier has big-time tools, a workable jumper and a nearly 7'2" wingspan. His game isn’t polished, but he covers a ton of ground and is the type of flier teams are eager to take. He has some bad habits and is more of a reactive than instinctive player who needs work as a decision-maker—his feel for scoring just isn’t that great. But if Frazier plays hard consistently, hits open threes and continues to generate extra possessions on the defensive end, he could make it work. He’s getting looks in the late first round. 31. Suns: Keita Bates-Diop, F, Ohio State | Jr.
32. Grizzlies: Jacob Evans, G/F, Cincinnati | Jr.
33. Mavericks: Bruce Brown, G, Miami | So. 35. Magic: Khyri Thomas, SG, Creighton | Jr.
37. Kings: Rawle Alkins, G/F, Arizona | So. 38. 76ers: Jevon Carter, PG, West Virginia | Sr.
39. 76ers: Jarred Vanderbilt, F/C, Kentucky | Fr. 40. Nets: Moritz Wagner, C, Michigan | Jr.
41. Magic: Gary Trent Jr., SG, Duke | Fr. 42. Pistons: Shake Milton, G, SMU | Jr.
43. Nuggets: Hamidou Diallo, SG, Kentucky | Fr. 44. Wizards: Omari Spellman, F/C, Villanova | Fr. 46. Rockets: Landry Shamet, PG, Wichita State | So. 47. Lakers: Chimezie Metu, F/C, USC | Jr.
48. Timberwolves: Kevin Hervey, F, UT Arlington | Sr.
49. Spurs: Trevon Duval, PG, Duke | Fr. 51. Pelicans: Devon Hall, G, Virginia | Sr.
52. Jazz: Tony Carr, PG, Penn State | So. 53. Thunder: Malik Newman, G, Kansas | So. 54. Mavericks: Kostas Antetokounmpo, F, Dayton | Fr. 55. Hornets: Raymond Spalding, F/C, Louisville | Jr.
57. Thunder: Donte Grantham, F, Clemson | Sr.
59. Suns: Svi Mykhailiuk, G/F, Kansas | Sr.